I have grand aspirations to expand our garden’s production this year and to increase the Lawn to Food Urban Farmstand sales, by offering a new variety of items. My garden plan includes doing more succession planting to up vegetable yields and to grow more plants that can be used in soap making such as calendula, lavender, camomile, mint, rosemary, fennel and lemon balm. 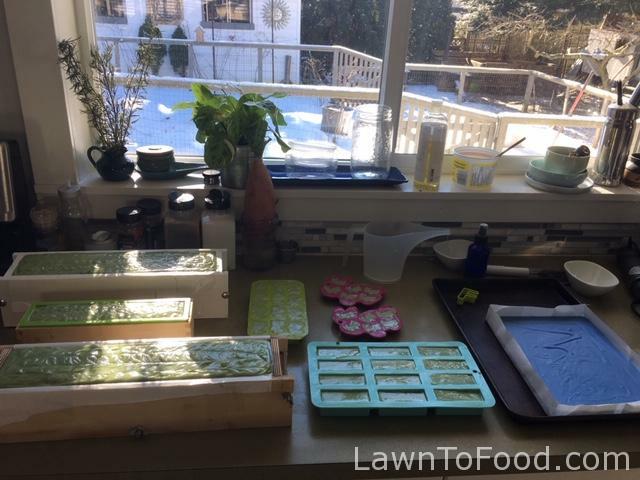 This winter I have being learning the craft of cold process soap making (thanks Karen!) and love it, especially the results! The pluses of homemade soap are many, but the important ones for me are that I get to chose the ingredients, it eliminates liquid soap plastic pump bottles from our home and it’s a very creative outlet, that I throughly enjoy. I’ve chosen to make simple plant-based soaps without the use of pork fat (lard) or beef, buffalo, moose (tallow) and have also chosen to avoid palm oil. 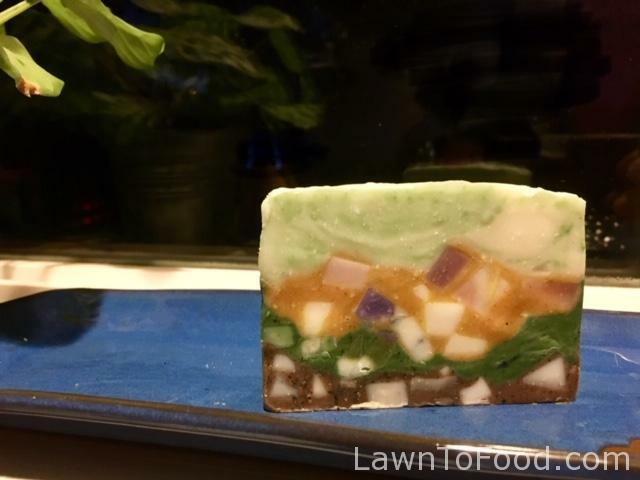 Animal products, lard and tallow, make some great soap and they are a good way to use up all of an animal that has been raised for our consumption. It’s just not something that I am choosing to use in my soaps. I’ve also decided to not use any detergents, dyes or micas to colour my soaps as many commercial producers do. I’m sticking to using plant derived powders, bamboo-charcoal, mineral oxides, clay and rock dusts to add interesting colour and other benefits. My soaps are a combination of olive, coconut, grapeseed, avocado, castor bean oils, water and lye (sodium hydroxide). I’ve been playing with percentages and oil combinations to see which recipe that I like the most. Coconut oil is very cleansing, olive oil is moisturizing, and others increase bar hardness, lather, conditioning and adding coconut milk can increase creaminess. It has been lots of fun to do the experiments and to feel the fresh, silky and oh, so clean results. As happens, when you try anything new, I’ve made mistakes along the way but that all adds to my experience. Soap batches that got too thick before I could swirl in colour, or those that ended up oddly-shaped and over heated, ended up in my discard basket. Not that there was anything wrong with them for usability, they just didn’t look as pretty as I wanted. These pictures are of some of my recent batches. Dried calendula blossoms were soaked in some grapeseed oil for 4 days. Then the petals were pureed into that oil and it was all added to this soap batch. I also added 1 tsp of turmeric for more colour and some sandalwood essential oil. I sprinkled a few calendula petals on top for a pretty finish. Calendula soap with petals , a bit of turmeric and sandalwood e.o. 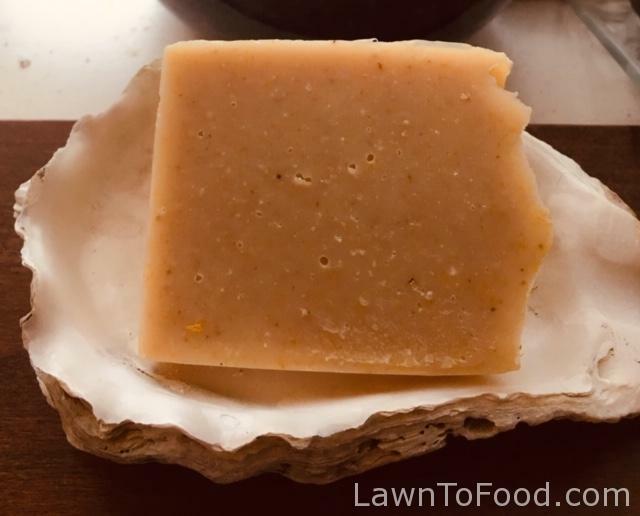 Calendula Bar – ingredients: olive oil, coconut oil, grapeseed oil, coconut milk, castor oil, water, sodium hydroxide and sandalwood essential oil. These two batches of soap both include added coconut milk with the plant-based oils that I used. The blue swirl soap is created with lapis lazuli stone dust that was save from a rock tumbling polisher. The lighter coloured blue in this soap was created by using indigo powder. “Plain Jane” unscented and “Rain Drop” coloured with lapis lazuli & indigo. Those are very pretty, but what was I going to do with all of the discarded bits of soap? 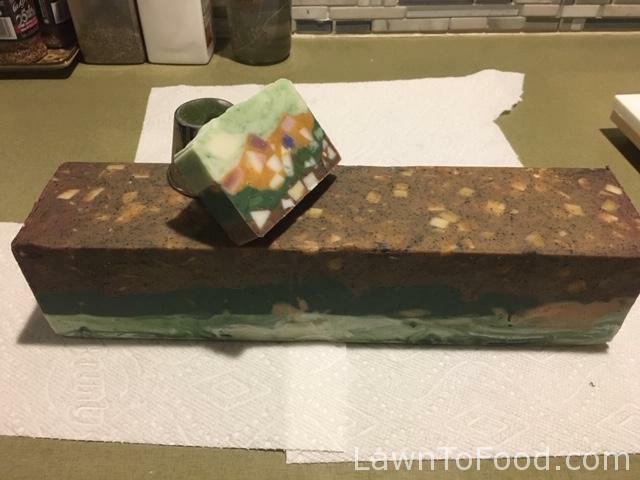 I’d been reading about embedding soap pieces into new soap batches as a way to use up excesses and that got my creativity sparked. Yesterday, I tried to make my discards into something special (my second attempt at this process). I chopped up all my extra pieces of soap and then divided them into colour groups. 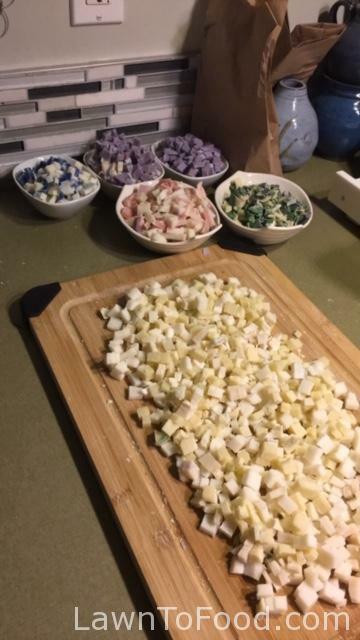 Chopped pieces of discard soap slices to be repurposed into a new bar. My game plan was to make some layers of different coloured soap and then fold in the chopped bits for texture. I mixed up a large batch of creamy soap batter and then divided it into 4 bowls. The first, and bottom layer, was going to be brown and exfoliating, so I added cocoa powder, coffee grounds and activated bamboo charcoal to achieve those affects. I then mixed in about 2 cups of white soap chunks. To the second layer I added some green chromium oxide powder and all the chunks of soap that had green in them. The third layer received some turmeric for yellow colour and the blue and purple chunks of soap. The fourth, and final layer, received a drizzle of green chromium oxide to create a swirl affect and some “pear” fragrance oil. I forgot to take into consideration how much the volume the chopped pieces of soap would increase my batch size! 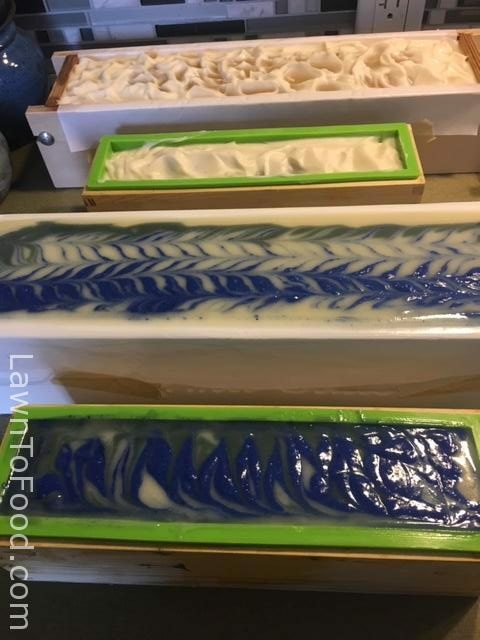 I ended up with too much new soap when my 3 rectangle bar containers were filled with layers. I quickly grabbed some silicone molds (pears, bunnies, and little rectangles that I can use as samples) to pour the swirled green “topping” into. Soaping on a sunny, cold day in Comox. 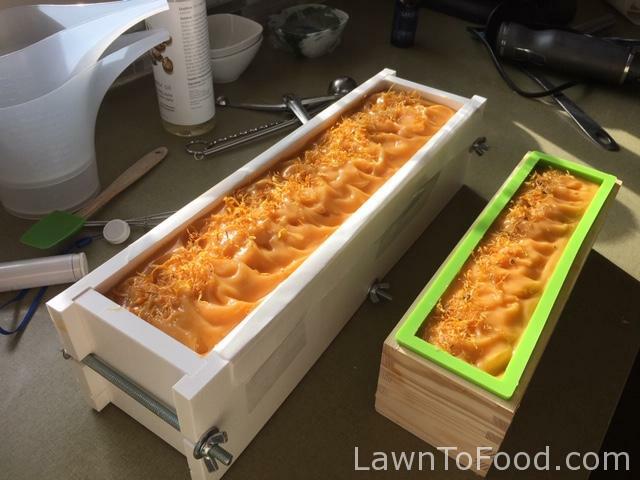 I unmolded the layered soap this morning and got ready for the most exciting part of soap making, The Cut. I was shocked to see how well this re-batched soap turned out! It is beyond my expectations for artistic interest AND it’s a cleaning, luxurious bar of soap. Unmolding my recycled chunks of soap into a a new batch. I am excited to see new products coming to your farmstand. Love all your homemade delectables.